Located on N Graham St between Dalton Ave and I-277, Extra Space Storage serves Charlotte residents near Lockwood, Greenville, Fourth Ward, Optimist Park, and more. Locals will recognize our facility near the Charlotte Fire Department Headquarters and The Salvation Army Center for Hope Shelter. Are you a college student who needs summer storage or storage while studying abroad? Extra Space Storage is about 1 mile from Johnson & Wales University and 1.8 miles from Johnson C. Smith University, making us a convenient option for students living in and around Downtown Charlotte. 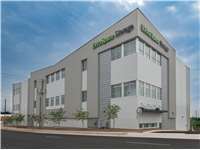 With a variety of storage units, climate-controlled storage, drive-up access, and exceptional security, Extra Space Storage on N Graham St is the self storage partner you can count on near Lockwood, Charlotte. Our Charlotte storage facility has units in sizes 5x4 to 10x30 with features like first-floor access, elevator access, and drive-up access. We can accommodate residential and commercial storage needs! With advanced security measures like an on-site manager, 24-hour video surveillance, and electronic gate access, you can store valuable belongings with peace of mind at Extra Space Storage. Protect sensitive items from Charlotte's extreme heat and humidity with a climate-controlled unit! Units with climate control stay comfortably between 55 and 80 degrees year-round! Make unloading and loading heavy items easier with drive-up access! This amenity allows you to pull a vehicle right up to move items in and out quickly. Drive-up units are also great for storing small vehicles like cars, motorcycles, as well as some commercial trucks and vans. Extra Space Storage strives to deliver dependable self storage backed by exceptional customer service. We maintain a secure, clean facility at all times, and our friendly, professional staff is always available to provide assistance and answer your questions. We want you to have an excellent experience with us. Contact us today to reserve a storage unit in Charlotte! Savanna was terrific! Great follow through and follow up. She is the reason I went with Extra Space instead of any of the other three storage places I checked out. Great location and fair price as well. My experience with them was awesome. They made sure that I got the space I needed at the right price. Extra Space Storage is in a convenient location, about 5 minutes away from uptown. It has been very clean and well maintained. The prices are also very fair. Yes I would Thank you. Great experience, and great customer service. Great customer service. Very clean and secure. Great location for me! The storage location is convient to uptown and downtown Charlotte. Brandon is very polite he was very professional when I went in to view the storage unit. I highly recommend this place. Safe, modern facility, would recommend to my Army Strong brothers! Leaving most of what you own can be difficult. My belongings are being stored long term. Knowing my things are in good hands makes this process a whole lot easier. The facility is immaculate. The security features are reassuring. The staff is great. Take I-77 South/NC-16 South . Take exit 4 for US-29/NC-49 towards Graham St. Turn right onto W 10th St. (signs for U.S. 29) Turn right onto N Graham St. Site will located on your right. Take I-77 N/US-21 N to W 10th St. in Charlotte. From I-77 S/NC-16 S take exit 4 for US-29/NC-49 toward Graham St. Turn right onto W 10th St ( signs for U.S. 29) Turn right ontho N Graham St. Site will be located on the right. Take NC-24 W/NC-27 to Albemarle Rd in Charolette. Follow Albermard Rd to US-74 W/E Independence Blvd/E Independence Expressway. Use the right 2 lanes to take the I-277 N/NC-16 S exit toward US-74 W. Merge onto I-277 N/NC-16 N. Take exit 3B toward Church St./Downtown/Graham Street/U.S. 29/NC-49. Merge onto W 12th St. Turn right onto N Graham St. Site will be located on the right. Take Interstate 85 N to Charolette. Take exit 36 for NC-16/Brookshire Blvd. towards U.S. 74E/Downtown. Keep right at the fork, follow signs for NC-16 S/Charlotte and merge onto NC-16 S/Brookshire BLVD. From NC-16 South take exit 4 for US-29/NC-49 towards Graham St. Turn right onto W. 10th St (signs for U.S. 29) Turn right onto N Graham St, site will be located on your right.